In our last blog entry we took a look at getting your orders out the door. This week, to truly cap off that final stage of the fulfilment process, we’re going to pay closer attention to picking, packing and labelling. By using Temando, you are able to streamline this entire process by generating pick slips, booking shipments and printing consignment labels directly from the backend of your Magento store. 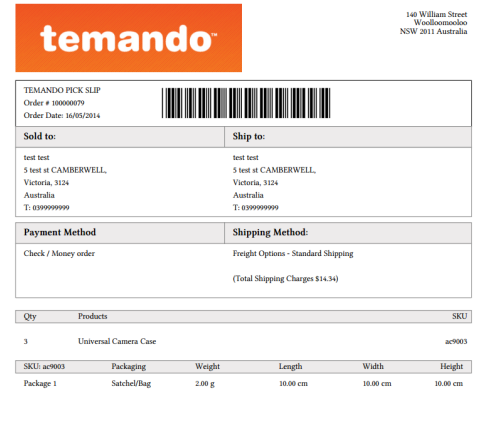 Temando is also able to assist in provisioning partial shipments and distributing tracking emails to your customer. Here’s a rundown on just how easy it is to pick, pack and label your orders. Once an order has been placed by a customer it will appear in the ‘Manage Shipments’ menu located within the Temando tab on your Magento dashboard. Clicking on an individual order from this list will present the order details. Clicking ‘Pick Slip’ in the top right corner will download the pick slip for the order. The pick slip gives details for the order such as the order number, delivery details and most importantly, the SKUs and quantity of SKUs required to fill the order. Now that the order has been picked and packed into its packaging (Satchel, Box, etc.) all that is left to do is book and label the shipment. To book, simply scroll down to the bottom of the order summary page. Here will be a list of available quotes with the Cheapest and Fastest options indicated. Simply click ‘Book Quote’ to confirm the booking. Now in the top right, a button to ‘View Consignment’ will be available. Click the button to download a pdf file with the consignment label. Simply print this off, attach it to the package and it’s ready to go. In addition to the above processes, Temando’s Business extension for Magento removes the need to pick, pack, book and label orders individually by enabling you to print multiple pick slips at once. To do this, simply navigate to the ‘Manage Shipments’ grid and check the shipments you wish to print pick slips for. Next, click the drop-down on the right hand side and click ‘Retrieve Pick Slip’. This will generate a single PDF document with pick slips for all of the selected orders. Then, when you’ve packed the orders you can book shipments and print consignment labels from the same dropdown menu. Once they’re labelled it’s just a matter of waiting for collection! This edition of our Plug into better shipping blog series has hopefully demonstrated the benefits that Temando provides with regards to pick, pack and labelling. By generating pick slips and booking shipments directly from the Manage Shipments grid of your Magento dashboard, Temando removes manual entry and guesswork from the fulfilment equation. This reduces the chance for human error and can provide significant time savings to your operation. To find out more about picking and fulfilling multiple orders with our Business extension, get in touch with our Solutions team.